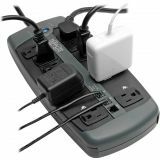 Grounded cord with space-saving right angle plug makes equipment setup easy. 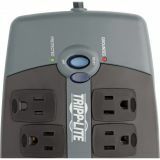 Tripp Lite Protect It! 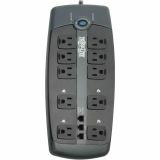 Surge Protector, 10 Outlets, 8 ft. Cord, 2395 Joules, Black - Economical AC surge protector is designed for workstations, PCs, telecom systems, home electronics and other sensitive equipment. 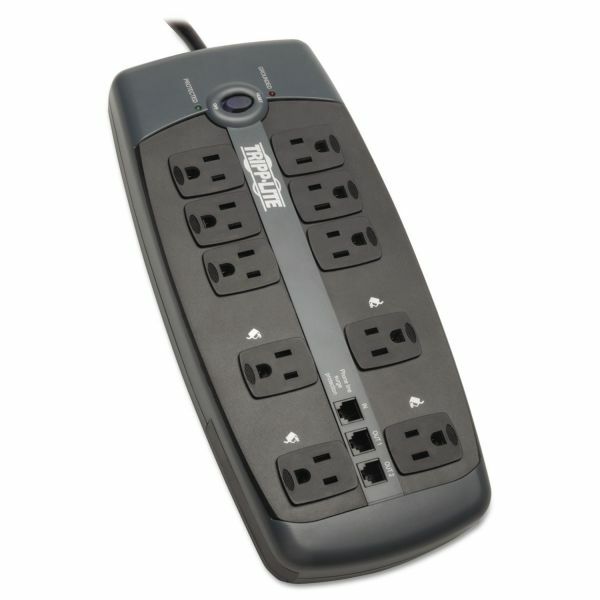 Accommodates bulky transformers without blocking remaining outlets. LEDs warn of potential power problems. Features 10 outlets, telephone protection, an 8' cord with a space-saving right-angle plug, and EMI/RFI line noise filtering. 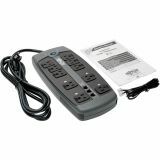 Surge suppression rating of 2395 joules. U.L. clamping 330V. 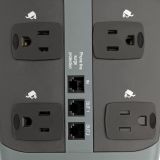 Built-in RJ11 jacks. 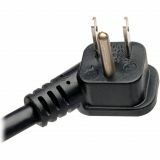 Features a space-saving right-angle plug.